A decade after the CLEO detector was decommissioned, it is still producing results. The American Physical Society (APS) is recognizing a Syracuse University professor for his contributions to particle physics. Sheldon Stone, Distinguished Professor of Physics, is the 2019 recipient of the APS' prestigious W.K.H. Panofksy Prize in Experimental Particle Physics. 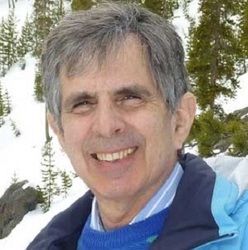 "We applaud [Stone's] transformative contributions to flavor physics and hadron spectroscopy, in particular through his intellectual leadership on detector construction and analysis on the CLEO and Large Hadron Collider beauty [LHCb] experiments, and for the long-standing, deeply influential advocacy for flavor physics at hadron colliders," says APS President Roger W. Falcone. Sheldon Stone is a Distinguished Professor of Physics at Syracuse University where he has lead the Experimental High Energy Physics Group since 1993. He has made significant contributions to the fields of data analysis, detector construction, and phenomenology. Some of the most important results reported in papers he authored are the discovery of enhancements in the mass spectrum from b-baryon decay that are consistent with pentaquark states, precision measurements of the CP violating phases in Bs decays, lifetimes of the Bs meson, the b-baryon, and pseudoscalar decay constants of D+ and Ds+ mesons, as well as the first observations of Ds+, B0 and B+ mesons by fully reconstructing their decay products. Dr. Stone served as the Large Hadron Collider beauty experiment Upgrade (LHCb) coordinator from 2008 until 2011, during which time the project was organized and the letter of intent submitted. Currently, the Syracuse group is leading the construction of the silicon-strip tracking component of the upgrade. Dr. Stone also conceived of and led the construction of both the cesium iodide csl EM for the CLEO II upgrade and the RICH detector for CLEO III. He edited and contributed to both the first and second editions of the book B Decays, published by World Scientific, as well as writing several theory papers and seminal review articles. Dr. Stone served as the CLEO physics analysis coordinator in 1988 and as co-spokesperson from 2007 through 2008. He also was co-spokesperson of the BTeV effort from 1997 until its termination in 2005. He has been a member of the U.S. LHC Users Association executive committee since 2008 and serves as the vice-chair. He was a member of the Fermilab Physics Advisory Committee, Board of Overseers, and Board of Directors. Currently, he is deeply engaged in the first LHCb upgrade, while also planning for the next upgrade, as well as several new physics analysis efforts. Dr. Stone graduated from Brooklyn College with a B.S. in physics in 1967 and received a Ph.D. from the University of Rochester in 1972. He previously was an assistant professor at Vanderbilt University and a senior research associate and adjunct professor at Cornell University. Between 2011 and 2012, he was a scientific associate at CERN. He is a fellow of the American Physical Society.